For additional technical information or purchase, please contact MHI 513-772-0404 or sales@mhi-inc.com or please order directly through this store. For the replacement element (only) for an existing panel please click here. Mechanical Dimensions Per Panel. Please refer to the diagram above for dimensions. For layout possibilities, please see diagram alongside. T= 1.125″ (thickness of thermal shock resistant insulation slab below the heater coil). 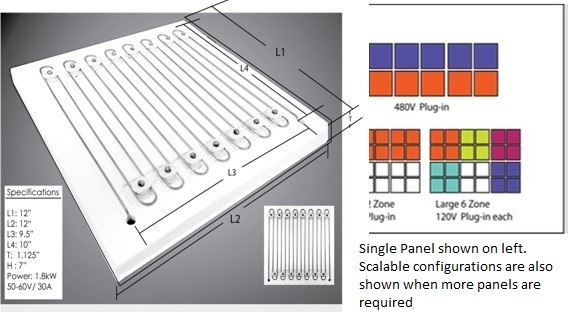 Nominal Power/Panel: The MHI URP Heating Panel is a universal scalable radiant panel that offer high temperatures of 1200C-1400C at ~1.8 kilowatts (this is the maximum temperature range and maximum power allowed for the heating coils (looped)). Each panel features special heating GAXP flat- coils (as shown) and Fractalin-ceramic spacers (as shown) that are mounted firmly on a thermal shock resistant insulation slab. This is a scalable module. Please only construct a furnace enclosure with these panels with approval by a local electrician – the panels carry current and can heat to high temperature. Each panel has two terminals below the ceramic board (not shown in the picture). Horizontal or Vertical use only, inverted usage is not recommended. For Vertical use please choose URP-V Vertical Panel. When using please ensure that no specification is exceed i.e. of the rated current, voltage, power and temperature, together. This heating panel can be used with a BPAN control system which can also be acquired from MHI Inc. Please email sales@mhi-inc.com or call 513-772-0404. Electrical Specifications: Each Panel ~ Maximum panel volts are 58 Volt, maximum current should not exceed 30 Amps (RMS maximum). The maximum coil temperature should not exceed 1350C on the coil as measured with a two color optical pyrometer. Note that two units in series equal 110V-120V plug-in. One URP panel – BPAN-O-PLUS and Power Transformer (choose a BPAN-O-PLUS-120 or BPAN-O-PLUS-220) and Power Transformer. Two URP panels in series- a BPAN-O-PLUS-120 (no transformer required). A control and a over- temperature thermocouple should be chosen for the BPAN-O-PLUS Control Panel. Thermocouple ptions are shown. Please also choose the thermocouple extender wire for each thermocouple. Four panels may be connected in series for 220-240V plug- in configuration. Balanced series parallel connections may be used (purple and red in the picture). All measurements are reported in the free radiating mode. For layout possibilities, please see diagram alongside. Lu = 7″ (Terminal Length). The terminals protrudes about 6″ from insulation board bottom (on the other side of the heating face). Use may request shorter Lu with quantity purchase. The connectors comprise of clip type connectors (that are used to connect the wire and solid terminal) and two wires. One set, when chosen from the options menu comprises of two clips and two wires i.e one for each lead. Ratings of the connectors are: 35 amp wire carrying capacity. Dimension – 6″ wire. If requiring to extend beyond the 6″ standard, please contact MHI and we will be happy to accommodate the request as best as we can. When checking out, the weight will be calculated with the control panel option. 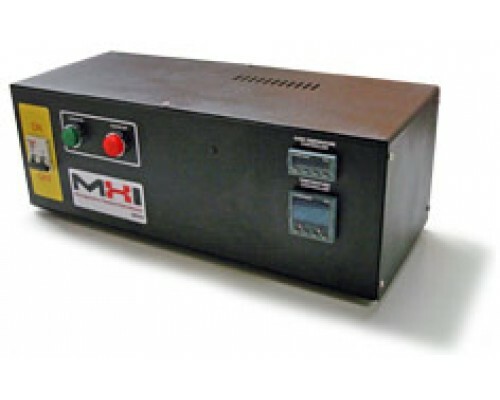 The correct weight and shipping price will be shown in the final acknowledgement from MHI.